Single Photon Emission Computerized Tomography, or SPECT scans, like the image to the left showing bilateral L5 spondylolyses, are highly sensitive for detecting spondylolysis but expose the patient to radiation. This is something I have known, of course, since training. In my current practice at Nationwide Children’s Hospital Division of Sports Medicine I and my group of fellow clinicians focus on youth athletes, and so we see large numbers of potential ‘spondys’ and, correspondingly, order a large number of diagnostic images. In 2012 we saw 548 new patients whose chief complaint was back pain; we ordered 227 SPECT images for ‘back pain’ in that same year. I share those numbers with the readership to give some context to the interest and concern with which I read the study article authored by a group from Children’s Hospital of Philadelphia. The bulk of the study’s original data looked at issues of the incidence of spondylolysis in the CHOP population, numbers that I have taken some issue with. The secondary focus of the study looked at one outcome the authors published regarding the issue of imaging for spondy. In their series of 2846 patients presenting with “mechanical low back pain” over an 8-year study period, they report that 73 of 88 patients (84.3%) that had a spondylolysis that received a bone scan had a positive scan. This number of 84.3% relates to the sensitivity of the bone scans used in the study (it is not reported how many of these might have been SPECT scans vs. other nuclear medicine bone scans). It also represents a frequency of advanced imaging much different than our center. What really drew my attention and is likely to make me change my practice is the authors’ transition to a discussion of radiation safety. The CHOP group details radiation absorbed doses for a variety of studies employed in detecting a spondy: 2-view plain films (AP and lateral); 4-view plain films (AP, lateral, and obliques); CT scans; and bone scans. What I learned is that the radiation effective dose for a 10 – 14.9 year old (our typical patient) is nearly 7 milliseverts (mSv) whereas a CT scan is a bit more than 1 mSv and 2-view plain film series is just under 1 mSv. Furthermore, the organ-specific dose for the urinary bladder is a whopping 50.3 milligrays (mGy), while a CT scan exposes the same organ to only about 1 mGy (though it exposes the colon to 6.6 mGy); this makes sense, of course, as in our hospital the SPECT protocol involves IV administration of technetium, which will eventually be excreted by the kidneys and stored in the urinary bladder until the patient voids. What do all these numbers mean? Indeed, I hope the readers share their thoughts as the discussion of resource utilization and radiation safety is an on-going issue, and multiple viewpoints should factor in the debate. As has been reported in many recent studies, the use of radiation-based diagnostic imaging has exploded over the last couple of decades in the United States, at least. 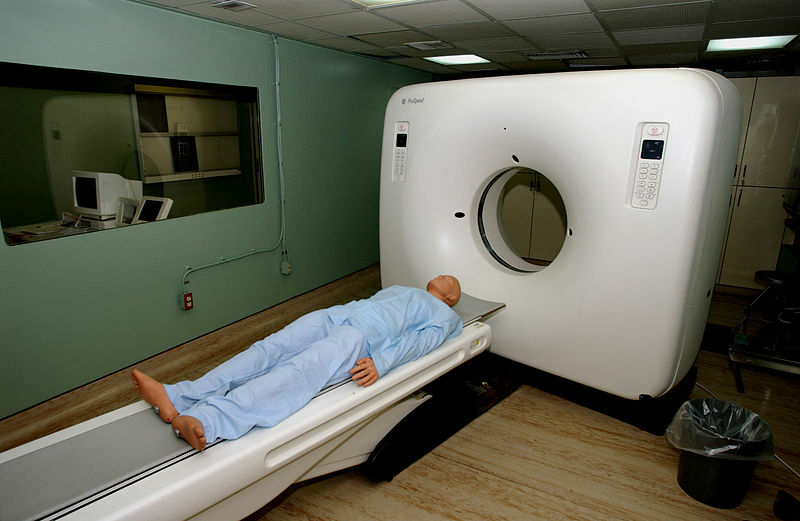 One study focusing on the increased use of CT scans in the United States has estimated that 2% of all future cancers will be caused by radiation from medical studies. These are sobering numbers. On balance, there is evidence that many of the studies we more routinely order, such as plain films, have comparable radiation levels as one might encounter with background, natural exposures. But I don’t want to be glib here: there is no debating the “ALARA” principle, which states that all radiation use should result in exposures “as low as is reasonably achievable.” There is no biological threshold below which radiation is ‘safe.’ The less one receives in life, the better. In the world of sponylolyses, the holy grail of imaging might be the MRI: a group in Japan published in the American Journal of Sports Medicine in 2012 their data on the use of MRI in detecting occult lumbar spondylolysis in young athletes. I certainly think that it is important to detect and manage properly this condition in a young athlete, but at what cost? The radiation exposure issues give me great pause. I definitely plan on working with our hospital radiology department in setting up an MRI protocol for detecting spondys. What do the readers think? Please comment on this blog. I’ll be responding to all comments. Also, take a look at the new poll on our journal’s web site, in the lower right corner of that web page. We haven’t even begun to talk about the controversy in treating spondylolyses in young athletes. How do you treat your athletes? Do you brace or not brace? Take the poll! Back in the days when I was a registrar in training, I was taught to perform AP, lateral and oblique lumbar spine x-rays, followed by SPECT / CT in the case of ongoing clinical suspicion of a symptomatic pars defect. Follow-up CTs were also ordered routinely, on a regular basis. These days I am much quicker to use MRI, which will show the majority of lesions, and also provides useful info on T2 imaging as to whether the lesions are ‘active’ or not. Obviously, there is the advantage of no exposure to radiation as well with an MRI scan. I tend to use a ‘2-week’ rule to see if symptoms settle conservatively if there is clinical suspicion of a symptomatic pars defect prior to imaging. If a lesion is seen, then CT if often indicated, but I very rarely use SPECT. As for the question of bracing for symptomatic spondylolysis, there is still controversy around this subject. A recent (2009) Cochrane meta-analysis on the nonoperative treatment of spondylolysis and grade I spondylolisthesis in children and young adults (see here – http://onlinelibrary.wiley.com/o/cochrane/cldare/articles/DARE-12009106855/frame.html ) concluded that non-operative treatment was highly successful when measured by functional outcome, and that bracing did not seem to affect this outcome. This was a heterogenous population, not confined to those involved in active sport at any level. I’d be interested to hear the thoughts of our colleagues on imaging regimes and bracing. I think my story in its general aspects resembles yours. I think we start in training using ’eminence based medicine,’ and transition to evidence based medicine….hopefully! At Children’s Hospital, Boston, where I trained, we were routinely instructed NOT to order oblique plain films in the evaluation of a potential spondy. We did so to avoid unnecessary radiation exposure, and, indeed, the recent J Pedi Ortho article mentioned in the blog demonstrates that the 4 view series adds substantial radiation exposure over and above the 2 view series, and especially increases the exposure to the intrabdominal and intrapelvic organs. Of course, we were being penny wise and pound foolish; because after a negative 2 view series we would proceed to order a SPECT scan, and we often also obtained CT scans pre- and post-treatment. Ironically, I, like you, had additional training that made me perhaps more sensitive to the potential safety issues surrounding radiation: prior to my fellowship I had sat for and passed the California Radiation Supervisor Examination, which nominated me to be the physician in our clinic (where xray was available, but no radiologist was on site) responsible for issues of radiation safety. I learned about “ALARA” and exposure data that I never learned about in medical school. I am eager to pursue suspected spondys via the MRI route, but I have been unconvinced with what I have seen in the literature about MRI’s sensitivity/specificity when compared to the SPECT/CT model. On a more practical note, it also requires having a radiology center with the appropriate protocol and ability to perform the sequencing that would be important to ensure that a spondy would not be missed. Right now, our center I don’t think is geared up to do this. And then, we get to the next level of controversy: what to do with it in the first place. I was taken with (and disagree with) the notion put forth by the CHOP group, as I understood it, that a spondy might require little attention or intervention. As far as the natural history of the condition and its need for active intervention in the athletic population (and i stress that: the athletic population), I’m not entirely sure the right questions have been asked over the years. Back in the day, we got hung up over radiographic healing of spondys, but if that was the end point, indeed, the literature was confusing and mixed about the efficacy of brace vs. no brace. But i am unaware of any good literature looking at not only clinical healing but the answers to the following questions: 1) what are the patient satisfaction levels when following brace vs. non-brace protocols; 2) are there any validated outcome measures (oswestry, micheli functional scale, etc.) that have been used in large populations looking at potential differences in outcomes in brace vs. non brace protocols; 3) what is the time to return to sport; 4) at what level does a patient return to sport; 5) and, finally, what are the long term impacts, if any, of adolescent spondy on an athletes’ participation in their sport? I specifically hope to look at some of these issues myself in my career. For now, I use a rigid anti-lordotic brace protocol (courtesy of ’eminence based’ medicine: that’s what I was taught by Dr. Lyle Micheli and Children’s Boston) and I treat to a clinical endpoint; I almost never get CT scans after I am done treating a patient. I do, unfortunately, still rely on SPECT scans upfront. And I, and my group, are actively engaged in working with our radiology department on pushing forward to using MRIs in the diagnosis of a spondy. Thanks for your thoughts, keep them coming!!!!! I ‘liked’ the post because I especially like the discussion I am having with Dr. Hughes. For all you out there in the blogosphere, share your thoughts: they are valuable! We also have an editorial on the issue coming up in the next few weeks at the BJSM. John thanks for writing and sharing your blog post. Great information there. I see almost exclusively children and adolescent athletes. This information is weighing heavily on my mind: have a meeting with our radiology department in two weeks to develop and MRI sequencing protocol to detect spondys. Finally, I like the idea you mention about government, regulatory body, payors getting involved: nothing like a good old financial disincentive to make a clinician like me sit up and take notice. Thanks for taking the time to comment.